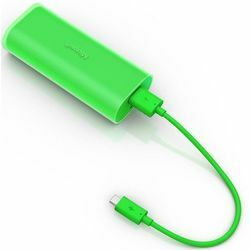 Power banks are not something anymore which we may need to define or justify their existence. They are already indispensable parts of our lives or our bags to be more specific. With the dependency of our lives increasing drastically on smartphones, the importance of power banks i.e., of course heavy duty and highly durable power banks has also increased. Meet this latest entrant in this arena, Microsoft DC-21 portable power bank! That name surely rings some bells, doesn’t it? Well, it is not just about the name, the specifications of this power bank also certainly live up to it. The sleek, seamless and clutter-free design on the outside packs a power capacity of 6000mAh. It is also very light in weight and handy to carry it around. Moreover, to enhance the style quotient, it is also available in three different shades. Buy this impeccable essential product at an equally awe-inspiring price here on Infibeam! Power banks are not something anymore which we may need to define or justify their existence. They are already indispensable parts of our lives or our bags to be more specific. With the dependency of our lives increasing drastically on smartphones, the importance of power banks i.e., of course heavy duty and highly durable power banks has also increased. Meet this latest entrant in this arena, Microsoft DC-21 portable power bank! That name surely rings some bells, doesn’t it?Well, it is not just about the name, the specifications of this power bank also certainly live up to it. The sleek, seamless and clutter-free design on the outside packs a power capacity of 6000mAh. It is also very light in weight and handy to carry it around. Moreover, to enhance the style quotient, it is also available in three different shades. Buy this impeccable essential product at an equally awe-inspiring price here on Infibeam!